110V Air Dryr - The Mildew Fighter! Air-Dryr is the safe, inexpensive & effective way to fight mildew, mold, cold drafts and corrosion. 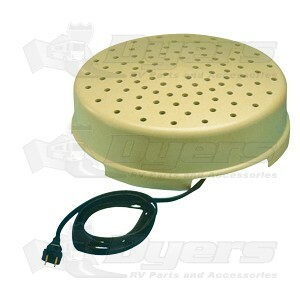 Ideal for boat, RV, home, office and any area with moisture build-up. Cool, damp air is drawn through the bottom base panel, then heated and released through the top perforated surface. Designed to operate anywhere 24 hours a day. The 1458 130 Watt Air Dryr draws 1.1 amps is recommended for motor homes, trailer, campers, boats, cabins, stored vehicles, etc.